Purchase Educational Signs (and other items with logo) from Johnson City Sign Shop. 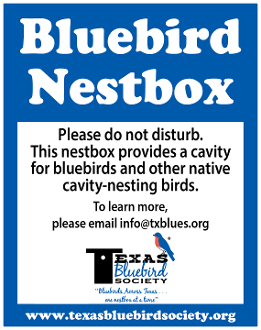 Visit shop.johnsoncitysignshop.net to purchase our Bluebird Habitat and Bluebird Nestbox educational signs. 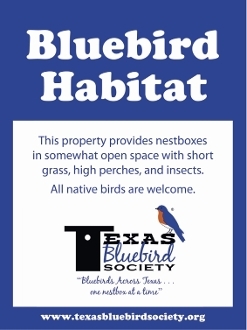 The shop carries several other items with the Texas Bluebird Society logo including a decal, key fob, magnet, and button. The Bluebird Habitat sign is 9" x 12" and the Bluebird Nestbox sign is 4" x 5"